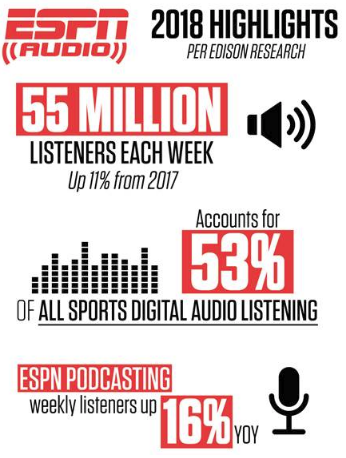 Edison Research Survey Results: 55 Million Weekly Listeners for ESPN Audio, Up 11 Percent from 2017. ESPN Audio was recently part of the 2018 Share of the Ear from Edison Research – a nationally representative study of 2,033 Americans ages 13+ that measures their time spent listening. 55 million people per week consume ESPN Audio programming, up 11 percent from 2017. ESPN Audio accounts for 53 percent of all sports digital audio listening. ESPN Audio podcasting saw a 16 percent year-over-year increase in listeners.